When your eggs look this good, go ahead and put them all in one basket. After Christmas and my birthday, Easter is my next favourite holiday. The chocolate, everything pastel, and (hopefully) balmy temperatures make this one “egg”cellent. And yes, the puns will continue throughout this post. Every year, I try to jazz up the most important part of the table –the Easter eggs. A while ago, I glammed them up with glitter. This year, since all things marbled are trendy, why not give this pattern a turn? Here are the easy steps that will make your eggs “marble”ous! 1. Fill your plastic container with lukewarm water. Pour drops of the nail polish colour you chose on different spots throughout the water surface. 2. Insert two toothpicks in the bottom of each plastic egg, where the string used to be. Dip the eggs into the water, gently swirling one or two times. 3. One out of the water, insert the toothpicks into the foam, holding the eggs up to dry for about 1-2 hours. Easter is finally here, and if you are scrambling to find the perfect egg design for your upcoming family lunch or dinner, then look no further! These spring fling Easter Eggs take just minutes to make and require no more than 4 supplies. With that in mind, pick up what you need and get crackin’! Have your tissue paper folded and ready, then hole-punch it several times.Take all the tissue that has collected in the whole-puncher tray and put it aside. Take your hard-boiled egg and cover one side with glue using the foam brush. Dab the cut-out flowers on to the surface with your finger, making sure that the layers separate each time you dab. Aim to form a line as you go along. Let dry and repeat on the other side. Follow these steps one egg at a time. Once they have all dried, you can add a thing layer of glue over the trail of flowers to smooth them out. When ready, display them in your favourite basket or tray, and even use them as a centerpiece! Easter is just a week away and with that holiday on the horizon, it’s time to get crafty. Of course, food, family, and the feast that usually ensues is the focus, but decorating the eggs is often what makes all of it fun. Traditionally, they are to be painted a deep shade of red –the hisotry of which you can read all about by clicking here! You don’t have to stick to tradition because in certain cases, rules are made to be broken. So rather than putting all of your eggs in one colour basket, try a new look and glam them up with glitter! 1. Colour your eggs with the dye shades you have selected, according to packet instructions. Let them dry. If you are using craft paint, apply it to one side using a sponge brush and let dry, then pain the other side and rest it on dry side. 2. Take your freshly coloured, but dried eggs and place them in an egg holder. With a crafts sponge brush, apply the glue to the top half of the egg I’m a downward motion, sweeping less as you reach the bottom in order to create an ombré effect. 3. 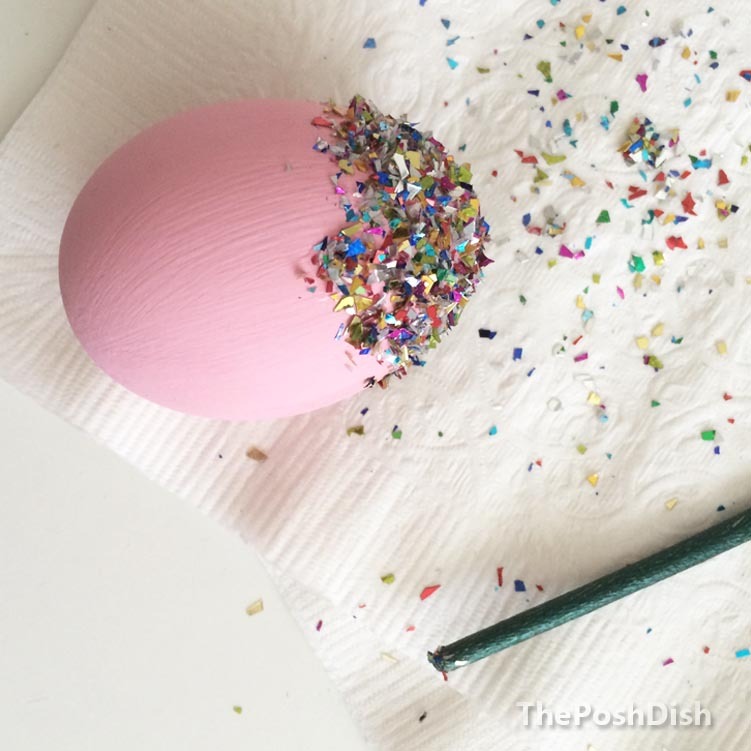 Before it dries, sprinkle generous amounts of glitter onto the glue-covered end of the egg. Make sure to place a napkin or paper underneath to catch the flakes that didn’t stick, and re-use them! 4. 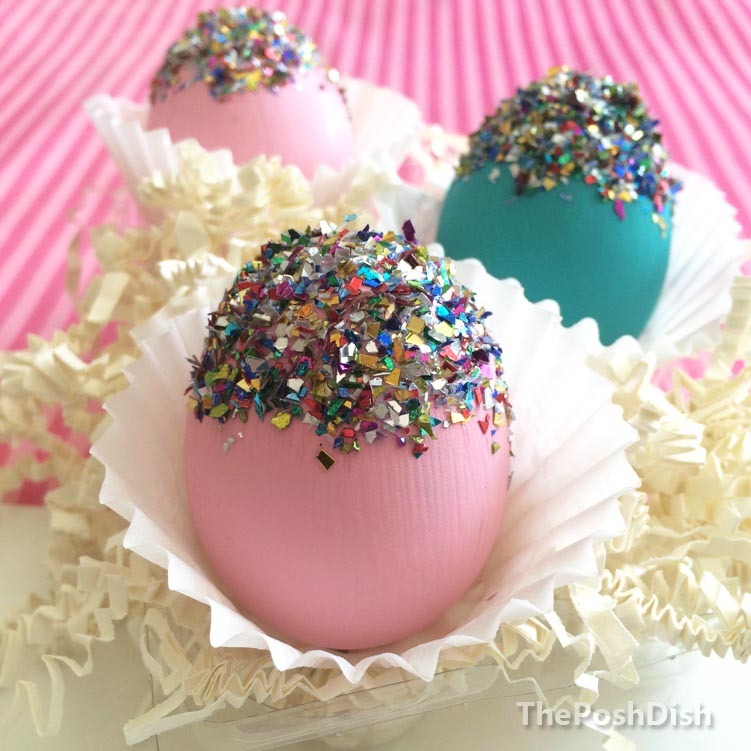 Place it in the egg holder to dry for at least 30 minutes, with the glittered end facing up. What are your favourite Easter traditions? Do you have any twists to the classic foods and customs? 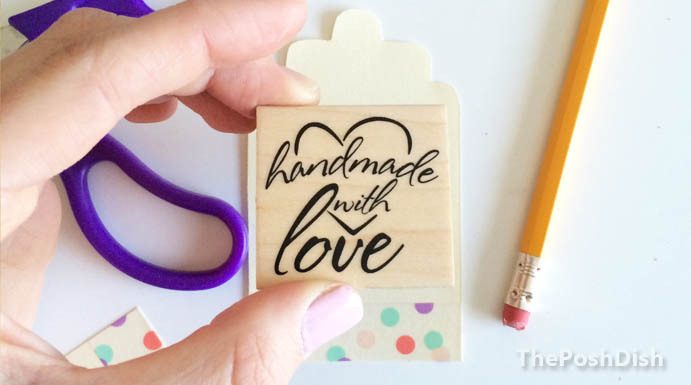 It’s time for another installment of DIY Sunday: one of the more fun blog posts to write and make because it means it’s time to get creative! 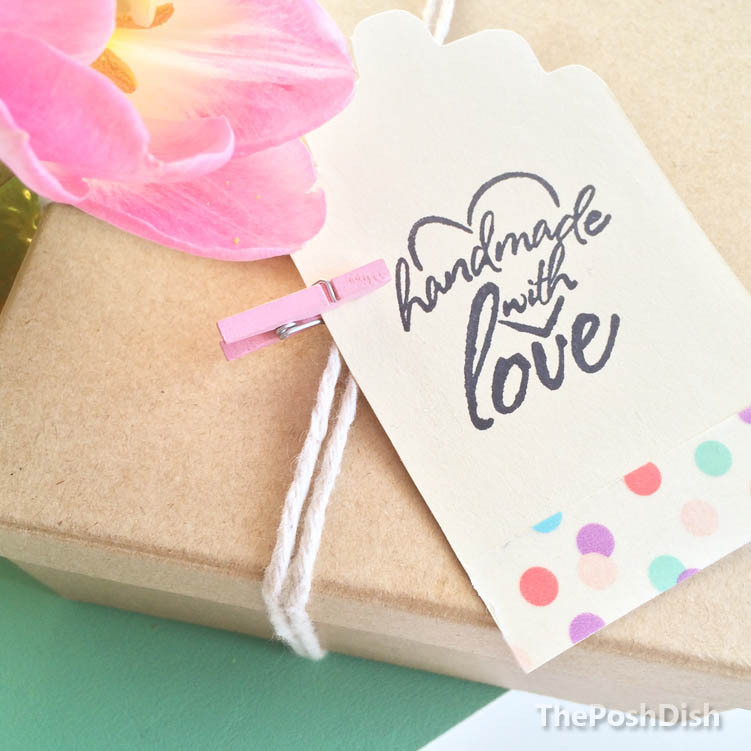 This week, you’ll be learning how to make craft tape gift tags. They can be used at any time of the year, for any event, and with any item. Clip it on to a box, or a paper bag, and watch your wrapping rise to the occasion. 1. Find the template of a tag you like online, and print it. Cut it out, and trace its outline onto the stock paper that you have chosen. 2. Cut that out as well using your scissors. 3.Measure a piece of tape that covers the bottom of the tag from end to end, and rip it so that it is a little longer. Line it up perfectly parallel to the edge of the tag and stick it on, wrapping the edges around to the back. 4. Attach the mini clothespin to the tag, and you can clip it on to bags, ribbons, boxes, and cards! With those four steps, you’re set to start gifting! What was the nicest wrapping you’ve ever received? Leave your thoughts in the comment section or tweet @ThePoshDish.